Homey baked fish, from Nova Scotia's kitchens. I remember this recipe from when I was young. My mother used to make it. Of course she never called her sauce a béchamel, but it was. No one from rural Nova Scotia would call it that. Many probably don’t even know that is the true name. It was just what their mother did, and her mother did, and so on. 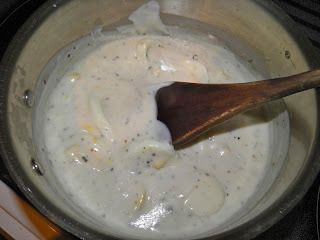 Béchamel is one of the “mother sauces” of French cuisine. It can be made to varying thicknesses depending on its final use, and is often flavoured with herbs or cheese. Some recipes even call for the addition of spinach or even crab. This one uses boiled eggs. 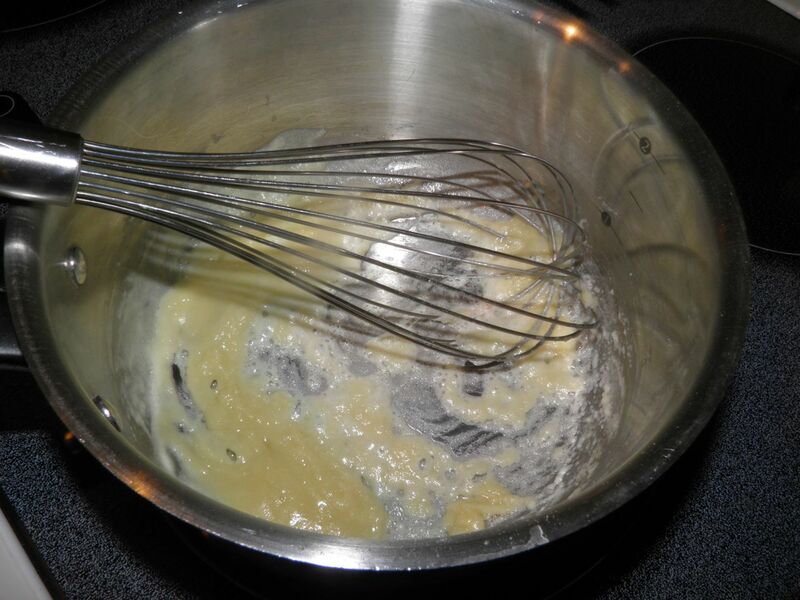 The “mac and cheese” sauce I made a few days ago starts as a béchamel. It was very good… Click here to see it. 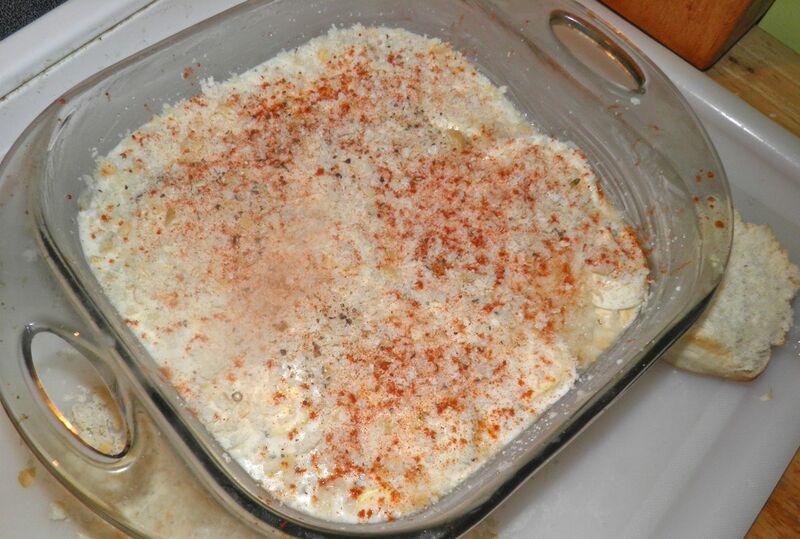 Baking fish in milk or other sauces is a very old cooking method. I wouldn’t even hazard a guess as to how old. I do know that Larousse Gastronomique (here) is full of them. Also many old (1700-1800s) recipes from Europe are still popular today. In days past, the further you got from an urban centre the more basic a recipe became. Since this one’s direct from the South Shore of Nova Scotia you can imagine it’s been stripped down to the bare essentials. break them up too much. It wasn’t so much a case of being “provincial” as being practical. Many of the spices and herbs that lift this recipe out of the ordinary weren’t seen as necessities to the country chef's pantry. Their finances were best spent elsewhere. So in my recipe – since I am urban – I put the herbs and spices back in that I imagine were taken out. Of course salt and pepper would have been used, but I brought back the tarragon and paprika. Both pair well with eggs and fish. Other than my “tweaks” this recipe is a very authentic old-fashioned Nova Scotia recipe. It hits the spot like an old-time recipe too. You should try it. 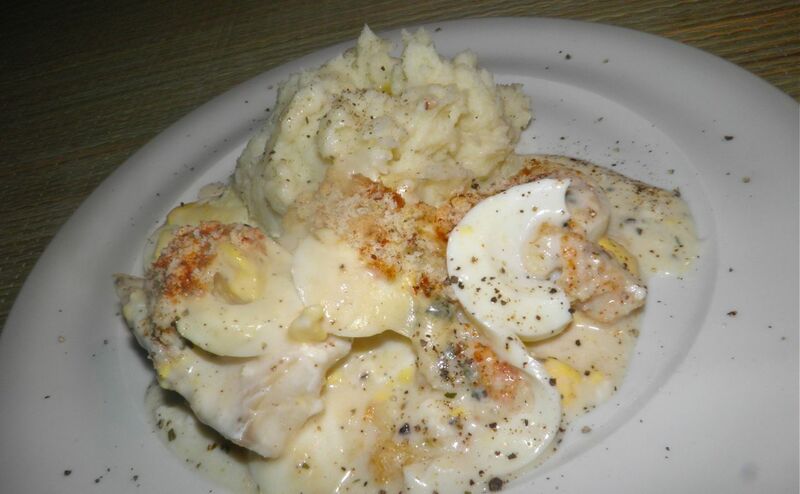 Frozen haddock goes on sale quite frequently and a few eggs certainly don’t break the bank. One final note. The béchamel may seem a little thick but that’s on purpose. 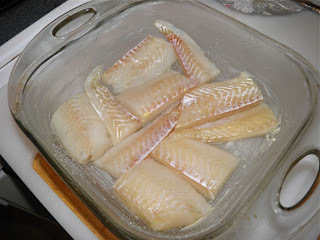 The frozen fish helps thin the sauce as the dish cooks so you have the correct sauce consistency after it’s baked. Butter the dish and cut the fish into manageable portions. Preheat the oven to 400°F. Butter a 8x8 baking dish. Cut the fish into easy to serve portions and arrange in one layer in the pan. Ready to go into the oven. Time to start the potatoes! Gradually stir in the milk and whisk until thickened. Let cook for about 1 minute. Remove from the heat and stir in the salt, pepper and cayenne. Peel and slice the eggs. Stir into the sauce taking care not to break the slices up too much. Pour the egg sauce over the haddock fillets in the baking dish. Sprinkle the top with the grated bread and then the paprika. You can add a little more salt and pepper if you wish. Bake for 25 minutes, or until the fish flakes easily when tested with a fork. Serve with fluffy, buttery, mashed potatoes.